IN Instrumentation Engineering, MA Mathematics, ME Mechanical Engineering, MT Metallurgical Engineering, MN Mining Engineering, PE Petroleum Engineering, PH PHYSICS, PI PRODUCTION AND INDUSTRIAL ENGINEERING, TF Textile Engineering and Fibre Science, XE-A (Compulsory for all XE candidates) Engineering Mathematics, XE-B Fluid Mechanics, XE-C Materials Science, XE-D Solid Mechanics, XE-E Thermodynamics, XE-F Polymer Science and Engineering, XE - G Food Technology, XE-H: Atmospheric & Ocean Science, XL-P Chemistry, XL-Q Biochemistry, XL-R Botany, XL - S Microbiology, XL - T Zoology, XL - U Food Technology. 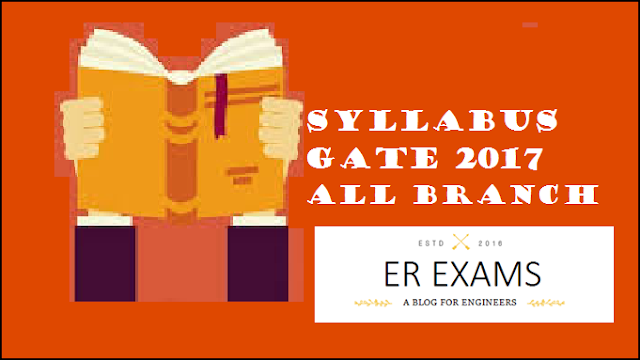 This year gate 2017 exam some shanges in exams syllabus so my friends read carefully syllabus. You may get all latest updates about GATE examination like GATE syllabus, exam pattern, exam date, reference books, mock test, sample papers, model papers and previous year question papers from our official facebook fan page. And also get latest update subscribes our news letter and get daily update into your inbox.